The central bank acts as the key intermediary between the fiscal arm of the government (Treasury or Ministry of Finance) and the "non-central government sector", which includes the private sector, sub-sovereigns, and even the external sector (for example, foreign central banks). How the central bank operates largely determines the nature of the monetary system. 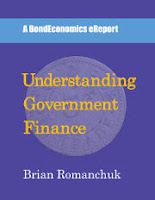 This article is an excerpt from the recently released eReport, Understanding Government Finance. 3.3 What Is a Central Bank? Central banks are the object of controversy and discussion, particularly since the focus in macroeconomics has shifted almost exclusively to monetary policy. For my purposes here, I am not interested in discussing the central bank’s role in stabilising the economy or inflation. Instead, all that I am currently concerned with is the role of a central bank as a bank. 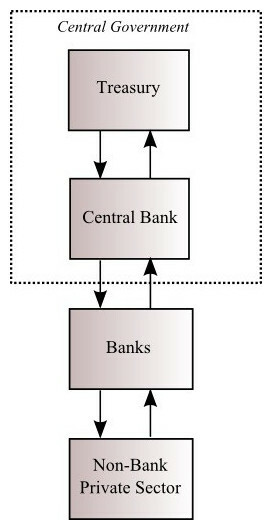 The figure below illustrates the flow of monetary transactions, with the central bank acting as the key intermediary for the government. Throughout this description, I use the term “Treasury” to represent the fiscal side of the government, although this may be the “Ministry of Finance” in some countries, such as Canada. The treasury has financial interactions with the rest of the economy via the issuance of government bonds and bills, and their associated payments (principal and interest). Even so, these interactions are mediated by primary dealers (definition )–which I lump in with the banks for simplicity herein–and the payment system. In some cases, the central bank or the treasury will move government deposits from the central bank to private banks. This flow of deposits is used to smooth out liquidity needs within the banking system. This is one of the few times that the central government does not bank with the central bank. I discuss this further in Section 5.3. The centralising role of the central bank means that the unit of account that it uses defines the unit of account within the wider domestic economy, as discussed in Section 2.2. For example, the Canadian dollar is effectively defined as one unit within the accounting system of the Bank of Canada. I will not address the important area of the clearing system within my discussions. The central bank is a key player in ensuring that the clearing system operates without incident. Clearing is the process of transferring money between banks , and needs to be very carefully monitored. If you are receiving a billion-dollar transfer from another entity, you should be asking yourself very carefully whether that other entity actually has control of those billion dollars. However, since I am not concerned about discussing the risks within the private sector, I assume that payments will always clear without default. This allows us to ignore the role of the clearing system. Since the central bank is always the intermediary for the central government when dealing with other sectors of the economy, the study of monetary operations largely depends upon the operational framework of the central bank. The next sections lay out that framework. Some central banks have minority private shareholders or shareholders at other levels of government. The ownership of the Federal Reserve System has become an object of controversy in some corners of the United States. This controversy is frankly ridiculous; the central government owns the common equity of the Federal Reserve System, and hence controls it; private banks need to buy preference shares (which offer no control) in exchange for being a “member of the club.” This is just a disguised capital requirement, and if the Federal Reserve were less politically tone deaf, they would abolish it as an anachronism. It is apparently still possible for some citizens to have a bank account at the Bank of England. A primary dealer is a firm that has the right (and obligation) to directly bid at the auctions of Treasury Bonds and Bills. These can be banks, or specialist dealers (less common now).